The ever evolving Management practices have impacted societies, cultures, technologies, environment, markets, public policies, business and trade, in a big way. Change is all the more overriding in the developing and less developed countries. Companies are investing in emerging markets and also on technology transfer and innovations in product and process design. The latter has a powerful bearing on business strategies and business models. The world being an open arena to several thoughts to be discussed and enlighten the research community it may be categorized into various streams. The organizations of various levels are facing with lot of issues in the administration and implementation areas. Hence it provides lot of avenue to systematize and explore. Lot of researches have been conducted and being conducted in all those areas to find the optimal solution. All these are discussed in various forums around the globe under a wide topic called Contemporary Management Practices. 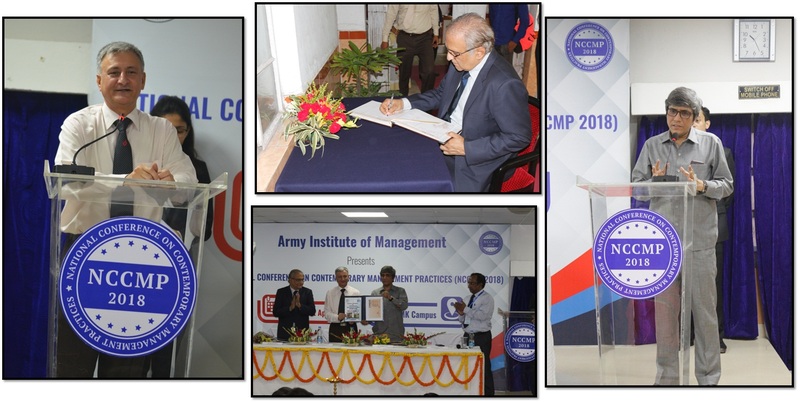 After a long gap since 2015, Army Institute of Management Kolkata (AIMK) had organized a National Conference on “Contemporary Management Practices” on 21st April 2018 (Saturday) at its premises. Dr. Ranajit Chakrabarty, Calcutta University, Dr. Suvasis Saha, Calcutta University, Dr. Asis Kumar Chattopadhyay, Calcutta University, Dr. P.K. Dawn, IIT Kharagpur, Dr. Gautam Bandyopadhyay, NIT Durgapur, Dr. Ashoke Kumar Sarkar, CUJ Ranchi, Dr. Soma Sur, St. Xavier’s University, Kolkata, Dr. D. Sampargi Raman, ISI Chennai, Dr. Rudra P. Pradhan, IIT Kharagpur, Dr. Sovan Chowdhury, IIM Kozhikode, Dr. Sharad Nath Bhattacharya, IIM Shillong, Dr. Kaustav Banerjee, IIM Lucknow, Dr. Sergill Musteata, Ion Greanga State University, Dr. David Blendall, Mr. Manish Agarwal, CEO East, Future Retail Ltd, Mr. Ranjit Kumar, GM & BS Head, LG Electronics, Ms. Piyali Roy Oberoi, VP, Images Group. The relentless support of conference organizing committee with Chairman Maj Gen Deepak Dhanda (SM), Conference Convener Dr. Ayan Chattopadhyay, Conference Co-conveners: Dr. Malini Majumdar, Prof. Protik Basu, Dr. Swapna Dutta Khan, other managing members and support team cannot be ignore. The conference was supported and contributed from all over India. NCCMP had received more than 80 research papers and 74 registered presenters from academia, industry, the research scholars and students who had came from various places across the country like Madhya Pradesh, Jharkhand, Jammu & Kashmir, Karnataka, Bihar, Maharashtra, Karnataka, New Delhi and West Bengal. Contributions of contributors of NCCMP 2018 was consolidated in e-book format and made available to participants in our institute for easy download. The publication of all participants will happen in Kindler, AIMK’s journal. Since the no. of paper are huge and we strictly follow the double blind, preferred review method 3 issues of Kindler will be published. First issue was already available in our website and remaining issues will be available very soon. Hardcopy would be couriered to registered participants. The inauguration of NCCMP 2018 was done in presence of august gathering by Prof. (Dr.) Saikat Maitra, Honourable Vice-Chancellor MAKAUT (Maulana Abul Kalam Azad University of Technology, West Bengal) and by Prof. (Dr.) Ajay Pathak Honourable Vice-Chancellor ICFAI University Tripura and Director IBS Kolkata. The opening ceremony had a special welcome address from the conference organizing committee chairman and Director Army Institute of Management Maj Gen Deepak Dhanda (SM). Prof. (Dr). Ranajit Chakrabarty, M.Sc, Ph.D in statistics was the head of Department of Business Management, Calcutta University where he served for 40 years. He was also the Dean, faculty of Commerce, Social Welfare and Business Management, Calcutta University. The University of Calcutta awarded him eminent Teacher Award in 2018. Prof. (Dr.) Suvasis Saha is Professor in Marketing, Department of Business Management, and University of Calcutta. He has above three decades of teaching and Research experience. His Research interest covers areas like Green Marketing, Service Marketing and Market Research. He was associated with the School of Management, Pondicherry Central University, Birla Institute of Management Technology, New Delhi, Indian Institute of Social Welfare and Business Management, Kolkata. Prof. Saha is recipient of several prestigious awards prominent among them are SIKHA RATNA-2017 from West Bengal Govt. Education Department, distinguished scientist award in marketing by VIFRA (Chennai) 2015, RASHTRIYA VIDYA GAURAV GOLD MEDAL AWARD’ from Indian solidarity council, New Delhi in the year 2016, Life Time Education Achievement award for excellence in the field of education by International Institute of education and management, Delhi in 2016. Associate Professor, Dean School of Management Sciences and Head (Department of Business Management) in Central University of Jharkhand, Ranchi. He has 13 years of academic Experience associated with several Institutes like Management Institute of Durgapur, JIS College of Engineering and Management, Future Institute of Engineering and Management and 22 years of Industry experience as Deputy Manager in Bihar State Financial Corporation a public sector undertaking. Dr Parveen Ahmed Alam has around 25 years of experience in the field of Management - 8 years as a management consultant and the rest as a faculty member. She started her academic career with her alma mater Indian Institute of Social Welfare and Business Management, spent more than 10 years with Army Institute of Management and is associated with Aliah University as Associate Professor in the Department of Management and Business Administration for over 2 years now.